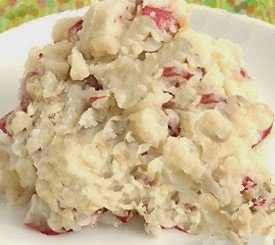 Crockpot Garlic Mashed Potatoes is a great recipe. It is perfect for freeing up time and a pot on the stove for holiday dinners like the upcoming Thanksgiving. The only problem I'd say you may have is how tired you may get of all the requests for the recipe! Halve or quarter potates (leave the skins on) so they are uniform in size. Add garlic, onion, salt, pepper and water (or chicken broth) and gently mix potatoes. Cover crockpot and cook on high 3 1/2 to 4 1/2 hours. (maybe 2 1/2 hours is sufficient in the newer crockpots). Stir potatoes at the 1 1/2 hours mark to prevent browning or drying out. Add more water or broth if necessary. When potatoes are cooked through, smash the potatoes with a fork or potatoe masher. Add cream cheese and butter. Stir in milk or cream a little at a time, mixing after each addition till desired consistency. You can serve now or switch crockpot to warm and hold potatoes until ready to serve.